THE STORY - Internationally-renowned pastor Carlton Pearson risks his church, family and future when he questions church doctrine and finds himself branded a heretic. ​After coming close to a Best Picture nomination last year with "Mudbound," Netflix is hoping to get to the party this year and their first film to try and do so is the Sundance 2018 film "Come Sunday." With excellent performances from the exciting ensemble, a pleasing visual style, and powerful themes strung throughout, the film is a rather pleasing one. Although the film does not venture much further out than its main discussion topic, it still is one worth listening to and certainly watching from the comfort of your home. 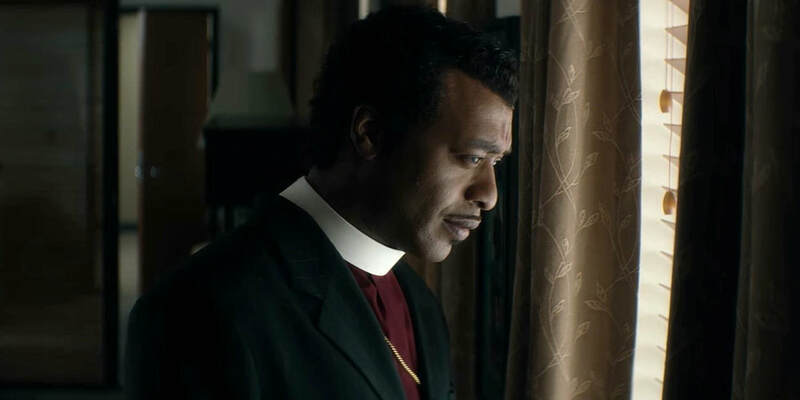 "Come Sunday" revolves around an African-American bishop named Carlton Pearson (Chiwetel Ejiofor), an eccentric and passionate preacher in Tulsa, Oklahoma. Bishop Pearson has achieved many things through his journey as a preacher like bringing white and black people into the same church during a time of racial turmoil. He has built a church up from scratch to offer as a safehaven for anyone who accepts the word of God, and of course he has changed many a peoples lives with his energetic and insightful sermons. After watching the news one evening and witnessing a report about hundreds of thousands of people dying in Africa, Bishop Pearson becomes troubled. For how can the God that we have all come to know and love allow this much suffering to happen in the world? One day, Bishop Pearson hears a voice. God's own voice speaks to him and tell him that, "The world is already saved. You do not need to accept me into your heart for I have already saved everyone." God tells Bishop Pearson that the world is drenched in the blood of God and that while a majority of people have not accepted God into their hearts, even though that they sin on a daily basis, God has still saved them. Bishop Pearson preaches this at his next sermon, telling everyone that God is loving and accepting of any and all people. Tossing aside 20,000 years of history and everything written within The Bible, Bishop Pearson is ostracized by his community. Sending him on a difficult journey of faith, regret, and love. seem to constantly overlook the fact that religion is not always sunshine and rainbows. Life is hard and there are constantly difficult choices for all of us to make. "Come Sunday" puts these difficult choices front and center for us to relish within. It is almost as if we are living through the pain that Bishop Pearson is living through while we watch this film. He brings everything that the Christian religion once knew and casts it aside. He tells everyone to forget what they knew and accept what he is telling them. Bishop Pearson says God is all-loving. He will love everyone no matter what their sin may be. But a majority of the Christians that Bishop Pearson preaches to, do not agree with this statement. They cast him out, insult him, and do everything within their power to ensure he cannot speak to a large congregation ever again. Of course, religion and faith are everything to Bishop Pearson. It is what he has based his entire life around so once he preaches something that in his heart he knows is true but then is put in question by his religious peers, it breaks him. He finds a void. His friends and family begin abandoning him and he starts to feel lost. But he pushes on. He trusts in the words that God spoke to him and he stands with his shoulders tall. He puts his faith and religion on the line all for what he knows is true. The film revolves around this battle he has not only with himself but the people around him, which is what makes this Christian religion based film much more complex than others. Aside from the clearly more intense and admirable approach to the theme of faith, the film thrives through its performances. The ensemble is absolutely excellent and plays off one another with ease and grace. Yet the star of the show is Chiwetel Ejiofor. He has proven time and time again that he is a downright brilliant actor with a lot of different tools in his tool box. If "12 Years a Slave" showed us how Ejiofor can transcend across different emotions with just his face, than "Come Sunday" shows us how well he is able to tackle heavy dialogue. He delivers each line with a clear cut emotion in mind and each line he gives sticks with you. He can be calm and collective all the while preaching the word of God then suddenly flip into energetic and agile dialogue when he becomes filled with grace and passion. Bishop Pearson's passion for faith and God bleed through the screen and it is all thanks to Ejiofor's brilliant performance. "Come Sunday" is not a masterpiece by any means but is definitely the best film that Netflix has released since "Mudbound." It tackles faith and religion in a way that we do not usually see. It expresses that even though religion is meant to be about the joyful and graceful times, but it also consists of dark and dreadful times. When we doubt ourselves because of where we are in our lives, where does that leave us with our religion? The film sets out to answer this question and does it exceedingly so. Though that is the only topic we focus on and it does get a little overbearing at times, it is still an excellent watch. With an amazing performance from Chiwetel Ejiofor and the rest of the ensemble, "Come Sunday" is a pleasant surprise from the Netflix originals department.